Myphone A898 another android phone from the Philippines. This android phone features a 4.0 ICS platform with a 4.3 inch capacitive touchscreen. Compared with other latest 4.3 inch smartphones the A898 is a lot affordable. 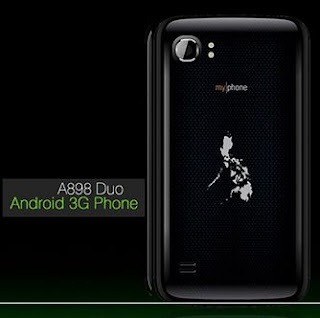 The A898 like any other Myphone comes with a dual SIM capability. A898 also features a 5 mega pixel camera on the rear with a 2 mega pixel camera. This is perfect for taking photos and uploading it on Facebook or Instagram. This phone can also be downloaded with the latest apps from google play app store, like temple run, skype, viber, fruit ninja, or Go launcher ex. up to 700,000 apps are available on google play.